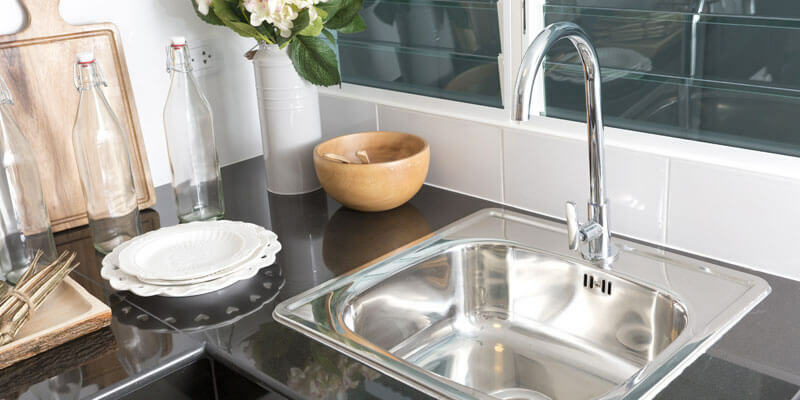 Every now and then, it might get to the stage where you’re thinking about replacing some of the items in your kitchen to help brighten things up and one of the most common “small jobs” that we’re asked to complete is a basic sink replacement. However, instead of spending money on a local plumber in Milton Keynes, you could use that money to do other things by fitting your new sink yourself. Many homeowners assume that replacing a sink is a tricky task – but it doesn’t have to be the case. In actual fact, you could have your new sink supplied and fitted by yourself in less than an hour by following this simple guide. This is how you can replace your kitchen sink in 6 easy steps. The first thing you’re going to want to do is to turn off, or “isolate” the water supply to the existing kitchen sink. Some supplies will have isolation valves fitted so that you don’t have to turn off the entire homes supply – However, if you need to do this, then go for it as its not going to cause any harm. When you’ve turned the supply off, you’ll need to test it to make sure that you’re not going to get soaked during your installation. The best way to test this is to open up the taps in the sink. Now don’t panic if water does start to feed out – this is perfectly normal and can run on for up to a minute. When the water supply has been cut off, you’ll need to do a little hunting and find the flexible connectors underneath the sink. In most installations, these are located at the base of the taps. When you have identified these, you can remove them. They aren’t usually too difficult to remove and can be screwed loose. However, rarely you may find that the taps don’t have any fitted. If that’s the case, you’ll need to cut the pipework using a compression nut. When you have removed the pipework or flexible connectors you can start to remove the pipework that is feeding the taps. These should just unscrew and come away relatively easily. Before you can remove the taps from the sink, you’ll need to find and remove some clamps that are holding the taps in position. Take a look at the base of the taps and the sink itself and undo them. There may only be one of them installed, however, it is more likely that there is two. When you have removed all of the clamps you should be able to lift the taps out of the sink. If you have trouble removing the clamps from the sink, you might want to use a small screwdriver to help release some of the pressure. A lot of plumbers prefer to remove the clamps completely because it just makes the installation a little easier. However, others will simply move the clamps out of position and reinstall them when the new sink is fitted. As you go to remove the sink from the surface you might find that there is still some silicone present. This would have been used to secure and effectively “glue” the sink into place. You can remove this using a small knife whilst you lift the sink to make it come away easier. If it helps, you might want to get the assistance of a friend or family member while you do this. Try not to lean on the worktop as they damage easily. When you have removed the sink completely, you’ll notice some leftover silicone. Again, using your knife or even a window knife make sure that you remove this as it will help you install the new sink later on. Take the opportunity to clean up any debris and grime that has built up underneath the old sink. Before you commit to fitting your new sink, you might want to lay in down on a soft towel or cloth so it doesn’t get damaged. 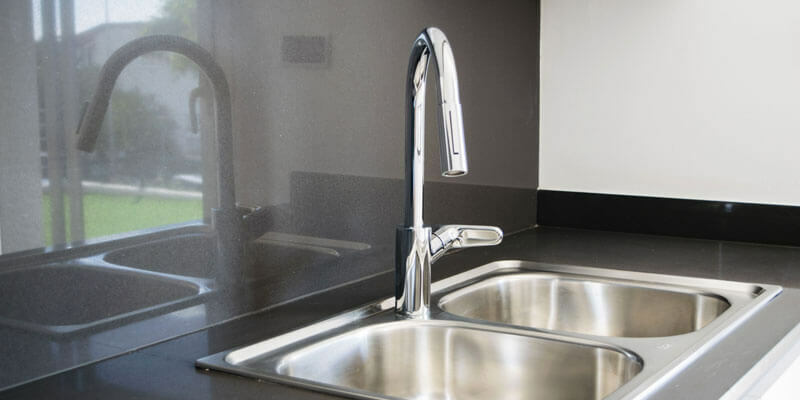 To help make the installation a little smoother, you can install the wastes and taps before laying the sink into position – it will also help save a bit of time when it comes to fitting. Line up the wastes so that they’re consistent along with the tap connections. Make sure that you have the tap in the right position too as once its fitted; it’s going to be awkward to reposition it. Lay the new sink into position and measure the connections and pipework before removing the sink again. Now you have the correct measurements for any pipework and wastes, you can complete the required work. When the pipework alterations have been made you can lay the sink back in and make all of the required connections. Remember to use fresh silicone to glue the sink into position. When it has had time to set, you can turn the water supply back on and test the new sink and taps. It may take a couple of minutes for the water supply to run consistently.